An unaltered photocopy of your DD-214, WD AGO, ERB/ORB or other military issued document clearly displaying your U.S. Army Cavalry Scout primary or secondary MOS: Pre 1981 Infantry Scout 11D. 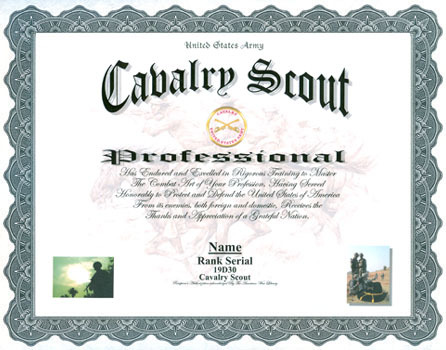 1981-Current: Cavalry Scout 19D. 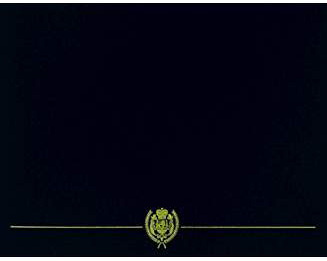 Colors: Although Cavalry is not a branch, yellow is used as a branch color for personnel assigned to Cavalry units. In March 1855, two regiments of Cavalry were created and their trimmings were to be "yellow." In 1861, the designation of dragoon and mounted rifleman disappeared, all becoming Cavalry with "yellow" as their colors. Yellow was continued as the color for Cavalry units subsequent to abolishment as a branch. Although the regimental flags for Cavalry units are yellow, the troop guidons are red and white without an insignia on the guidon.